What happens when the world’s greatest thief gets married? A whole lot more than he bargained for. Lupin the 3rd Part 4 is the story of Lupin and the gang’s adventures in Italy. It begins with his marriage and soon devolves into a battle against MI6 for a treasure of unspeakable value—with Lupin’s new bride at the center of it all. Most anime (and TV in general) these days is serial in nature, meaning that each episode is one chapter in a connected overall narrative. 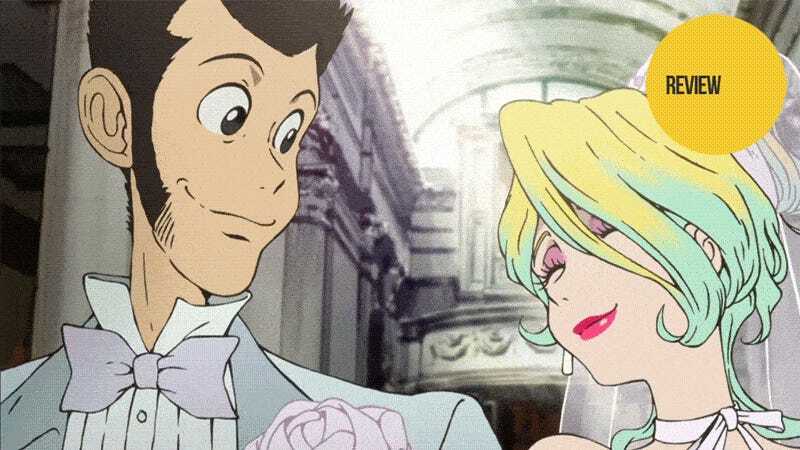 Traditionally, Lupin III has been the opposite, a series of self-contained adventures with little to connect them to one another other than the characters. However, Lupin the 3rd Part 4 is one of the rare series that falls somewhere in between a serial series and an episodic one. While many of the episodes seem self-contained at first, every once in a while there is an episode that ties the proceeding ones into a coherent single narrative. Of course, that’s not to say there aren’t a few episodes with little to no connection to the overall story. These episodes tend to be heavy character pieces—usually focusing on a single member of Lupin’s gang in their times away from him—and act as a short break from the overarching adventure. They also allow us to get to spend some time with characters like Jigen and Geomon who have little development in the main story itself. While Lupin is the main character of the franchise as a whole, he rarely gets any development directly. Rather he is a static tool used to explore the other characters in the series. Zenigata has always had an interesting role. He is the constantly outwitted cop, seemingly always a step behind our antihero. Yet, at the same time, he is presented as the only member of law enforcement who can outwit Lupin, even if only temporarily. Lupin the 3rd Part 4 takes it one step further. Zenigata is portrayed as perfectly capable of catching Lupin, and he does so several times in the series. The reason Lupin gets away is simply that no one else is as diligent and wary of Lupin as he is. In the end, Zenigata is just one man, and it is the schemes/incompetence of others that let the master thief escape time and time again. Upon this realization, we see Zenigata take it to its logical conclusion. If others are the weak link, take them out of the equation. The only way Lupin can truly be imprisoned is by Zenigata alone. Yet, can Zenigata truly watch the man he has spent his life chasing slowly die in a cage for the abstract concept of justice? In contrast to Zenigata, this series also gives us a new character on the side of law and order: Nyx. He is, on the most basic level, the James Bond of Lupin III with his crazy car and gadgets, though minus the womanizing. An MI6 agent more than willing to kill for queen and country, he has no interest in leaving Lupin alive should their paths cross. He is also a family man, which many of his enemies attempt to exploit, though to their own regret. Femme Fatale Fujiko gets a bit more development than the others in Lupin’s gang. While as capable as him when it comes to thievery—though using obviously different tactics—she is often seen as second fiddle to Lupin. She is also seen as a woman who would betray anyone for money. However, this series shows that she does have a code by which she operates. She would never kill Lupin or the others. She betrays them out of greed, yes, but knows they’ll figure a way out of their predicament. If any, especially Lupin, is in true danger, she always stands up. We also get a new look at Lupin and Fujiko’s relationship in Lupin the 3rd Part 4. At his most base level, Lupin only wants what he can’t have. He’s in love with the challenge of obtaining the impossible. That’s why he pursues Fujiko, a thief of similar caliber who promises everything but gives nothing. And while he may not realize this, Fujiko clearly does. She knows that the moment she admits to loving him is the moment she loses him forever. On one level, it is a heart-breaking realization. On the other, neither of them is truly as happy as when they are pulling a job together, be that as allies or adversaries. Because of this they are destined to be together physically but can never come together as a normal couple. What prompts this delving into how Lupin’s mind works is the introduction of Mrs. Lupin III. A rich Italian debutante, Rebecca succeeds at everything she tries. She’s a pop-star, an actress, a fashion designer, a model and even a wine maker. However, she does all this only because she is a complete adrenaline junkie. She is only interested in something until the point that the thrill is gone. The moment it is, she moves on to something else. So when Lupin marries her as part of a con, he gets far more than he bargained for. She is more than happy to be drawn into a world of danger and adventure alongside the world’s greatest thief. After all, what could be more thrilling? Rebecca is the best new Lupin character since the original five. Rather than a one-off damsel, she is a complex character with tons of development. In some ways, she is on par with Lupin. In others, she is a naive newbie to the whole crime game. And that’s really what it is to her: a game. She cares nothing for whatever treasure she is hunting, and will gladly return it after she has proven herself capable of stealing it. Of course, most of the people involved in crime don’t share her viewpoint, which can get her in far over her head. More than anyone else, Rebecca is the focal point of the series, even though she is only in around half of the episodes. Why she is the way she is, how she comes to terms with her past, and how she redefines her life in the aftermath serve as the main arc of the anime. There is also a large thematic focus on dreams in Lupin the 3rd Part 4. Much like the film Inception, dreams are treated as worlds in and of themselves. Moreover, from these worlds is where imagination and even personality come from. Dreams are even treated as a direct connection to genetic memory. While a fun topic for the anime to explore, it also serves to bring up an odd point about the Lupin III franchise as a whole: continuity. In the 45 years since the franchise’s animation debut, there have been many different interpretations of the main cast and what they do, with some decidedly darker than others. Because of this, Lupin III tends to have a rather loose canon, where past adventures are retconned, remade, or simply ignored to focus on the story at hand. Perhaps the most surprising aspect of the new series is that one of its most pivotal plot points—that Lupin never dreams—comes straight out of the 1978 film Mystery of Mamo. It’s odd (and somewhat confusing to casual watchers, I suspect) to see such a plot point dropped in casual conversation and then have no one expound upon it. It also leaves you wondering what other past events spread across decades might be important to what you are watching. Lupin the 3rd Part 4 is an astoundingly fun anime. It mixes action with comedy in a way that only a series with decades of practice can. If you want an epic story like in the Lupin movies, you’ll find it here. If you are looking for many smaller one-off adventures, you’ll find them here as well. Even if you’ve never seen nor heard of Lupin III before, but want to get in on the fun, this anime is an excellent place to start. There is a reason Lupin III has been going strong for 45 years now, and Lupin the 3rd Part 4 exemplifies it. Lupin the 3rd Part 4 aired on NTV in Japan and can be viewed for free and with English subtitles in the US on Crunchyroll.